Demo-ing Inflo: How much of our fossil fuel reserves can we use? This week we’re demoing Inflo at the Ontario Centres of Excellence Discovery Conference 2010. It’s given me a chance to play a little more with the demo, and create some new sample calculations (with Jonathan valiantly adding new features on the fly in response to my requests!). The idea of Inflo is that it should be an open source calculation tool – one that supports a larger community of people discussing and reaching consensus on the best way to calculate the answer to some (quantifiable) question. And here’s a live link to try it out. A few tips: the little grey circles under a node indicate there’s some hidden subtrees. Double-clicking on one of these will expand it, while double clicking on an expanded node will collapse everything below it, so you can explore the basis for each step in the calculation. The Node Editor tool bar on the left shows you the formula for the selected node, and any notes. Some of the comments in the “Description” field are hotlinks to data sources – mouseover the text to find them. Oh, and the arrows don’t always update properly when you change views – selecting a node in the graph should force them to update. Oh, and the units are propagated (and scaled for readability) automatically, which is why they sometime look a little odd, eg. “tonne of carbon” rather than “tonnes”. One of our key design decisions is to make the numbers as human-readable as possible, and always ensure correct units are displayed. The demo should get across some of what we’re trying to do. The idea is to create a visual, web-based calculator that can be edited and shared; eventually we hope to build wikipedia-like communities who will curate the calculations, to ensure that the appropriate sources of data are used, and that the results can be trusted. We’ll need to add more facilities for version management of calculations, and for linking discussions to (portions of) the graphs. 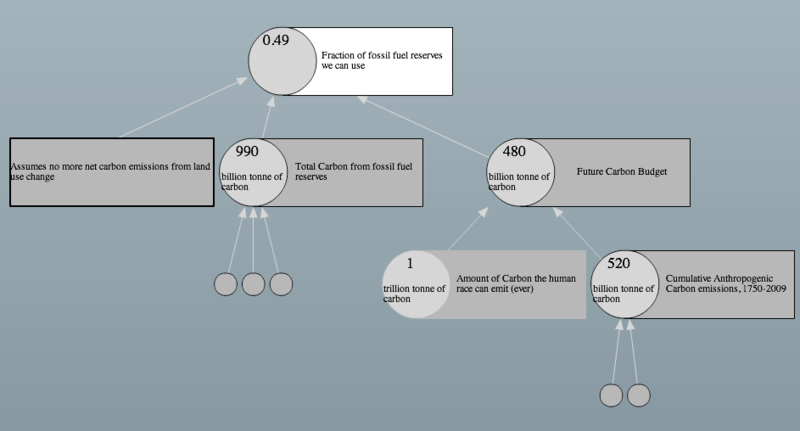 Here’s another example: Jono’s carbon footprint analysis of whether you should print a document or read it on the screen (double click the top node to expand the calculation). One suggestion — ‘warming’ is a red herring, for answering ‘how much can we burn’ realistically. Ocean pH change is more predictable, faster, and heading toward a well established flipping point. That will have happened before warming gets all that bad. This is simple chemistry, not radiation physics.